Original Editors - Corey Vogt from Bellarmine University's Pathophysiology of Complex Patient Problems project. Top Contributors - Corey Vogt, Eliza Clark, Megan Kanter, Elaine Lonnemann and Laura Ritchie - Your name will be added here if you are a lead editor on this page. Ehlers-Danlos syndrome is a hereditary collagen disorder characterized by articular hypermobility, dermal hyperelasticity, and widespread tissue fragility. Individuals with EDS demonstrate defects in the body's connective tissues, manifesting as altered strength, elasticity, integrity, and healing properties of the tissues. The severity of the syndrome varies greatly depending upon the specific mutation. However each type demonstrates some degree of integumentary involvement and/or joint hypermobility/laxity. Ehlers Danlos Syndrome traces its initial discover date and description to the fourth century BC. The first clinical description of EDS is credited to Tschernogobow in 1892. However, the name and recognition of the syndrome is credited to Edward Ehlers, a Danish dermatologist, and Henri-Alexandre Danlos, a French physician, both of who wrote separate reports in 1901 and 1908 respectively. The two physicians were able to collaborate in providing a description of the pertinent features of the condition as well as accurately identify the associated phenotypes. In 1997-1998, six discernable phenotypes for EDS were identified (classic, hypermobility, vascular, kyphoscoliosis, arthrochalasia, and dermatosparaxis) by Beighton et. al. These identifiable forms of EDS are currently recognized by the medical advisory board of the Ehlers-Danlos National Foundation and used in the clinical setting for proper diagnosis. All of these phenotypes of EDS can lead to significant disability and decreased quality of life for the individual. The disability is multidimensional including physical impairments, chronic pain, fatigue, maladaptive cognition, and psychological stress. Chronic Pain may be present in patients with the Hypermobility Type of Ehlers-Danlos. In 1997-1998, Beighton et al. in collaboration with the Ehlers-Danlos National Foundation proposed a system to distinguish the clinical manifestations of EDS into six distinct subtypes. This nosology is still being used in the clinical setting to achieve accurate diagnosis of EDS. Clinical Examination and a detailed family history have proven to be the most effective means of accurately diagnosing EDS. Laboratory studies can be utilized as supporting evidence to confirm the diagnosis of a specific subtype of EDS. CT scanning, MRI scanning, ultrasonography, electrocardiograms, and angiography are useful in diagnosing Type IV (Vascular) EDS with reports suggesting the presence of arterial aneurysms, arterial dissections, arterial ectasias, and arterial occlusions. Ultrastructural examination of collagen fibrils has been utilized as an assistive tool for diagnosis of Type I/II (Classical) EDS and Type VIIA/Type VIIB ( Arthrochalasia) EDS. Skin Biopsy using histopathologic analysis has yet to be proven as beneficial in the diagnostic process of EDS. EDS is classified as an inherited connective tissue disease. These patients’ tissues have greater amount of procollagen than normal and have a defect in the conversion of procollagen to collagen. Three patterns of inheritance have been linked with the various subtypes of EDS: autosomal dominant, autosomal recessive, and X-linked (rarest form). The exact source of genetic mutation responsible for the condition is unknown. However, mutations in ADAMTS2, COL1A1, COL1A2, COL3A1, COL5A1, COL5A2, PLOD1, and TNXB genes have been linked to causation of EDS. Patients who have the vascular type EDS also lack type III collagen. Type III collagen is fibrillation forming collagen of 3 alpha-1 chains and is the most abundant type of collagen in the human body. In adults, it makes up the majority of the extracellular matrix in internal organs, especially the cardiovascular system and skin, resulting in arterial and vein complications. Sudden death has been reported in some cases. Joint laxity manifesting as recurrent joint subluxations/dislocations due to minimal trauma and/or spontaneous onset. Joints involved typically include the vertrebral column, costo-vertebral, costo-sternal articulations, temporomandibular and joints of the extremities. Augmented biomechanics which results in less effective muscle contraction. Osteoarthritis resulting in early onset of degenerative joint disease. Early onset OA associated with increased mechanical stress placed on joints resulting from extreme ligamentous and articular laxity. Osteopenia due to reduction in general bone density. Precursor and predisposition to early onset of osteoporosis due to abnormally low bone density. Chronic pain results from the tight link of peripheral biomechanic dysfunctions and CNS fatigue. This often leads to fear of movement that is aggravated with activity, ultimately leading to muscular deconditioning. Aortic Root Dilation resulting in predisposition to arterial fragility or rupture. Typically occurs in a mild form in 25-33% of individuals with hypermobility and classic subtypes of EDS. Appears to be less severe than found in Marfan's Syndrome displaying no increased risk of dissection unless a prominent dilatation is present. Places individual at an increased risk for development of an abdominal aortic aneurysm (AAA). Currenly Ehlers-Danlos Syndrome has no cure. Treatment and management of the condition includes a combination of prevention, management, and education about the specific characteristics of the syndrome as well as how to avoid primary and secondary manifestations of the condition. Presently a specific treatment protocol does not exist due to the large variability of signs and symptoms present in affected individuals and amongst the various subtypes of EDS. Each specific treatment protocol is individually designed and specialized for the affected individual in order to meet the needs of that specific patient. Treatment of EDS typically consists of management of specific signs and symptoms of the condition as well as lifestyle adjustments to prevent injury/complications. Medical management is usually overseen by a physician specializing in physiatry/physical medicine and rehabilitation (PM&R). Referral sources include a physical therapist, occupational therapist, dentist, ophthalmologist, and genetic counselor to provide the patient with a comprehensive and holistic treatment approach. A recent study on women with hypermobility type EDS showed significant improvement in performance, performance satisfaction, and decreased kinesiophobia when provided with an intensive multidisciplinary rehabilitation program. This included a cognitive-behavioral approach with strength and endurance training and pain coping. Surgical and/or other invasive procedures are not necessarily recommended in patients with EDS as a means of primary treatment due to the impaired wound healing, increased likelihood of scarring, and increased likelihood of blood vessel rupture associated with EDS. However, certain subtypes of EDS, most notably the classic and vascular subtypes of EDS possess an increased predisposition to surgical complications compared to the others. Unfortunately, no set protocol of physical therapy interventions exists to address the impairments and functional limitations associated with EDS, due largely in part to the varied presentation of the condition for each affected individual. Therefore, each physical therapy plan of care must be specially created for the patient depending upon the subtype of EDS and the signs and symptoms of that patient. In general, physical therapy intervention focuses on decreasing the patient’s disability from a multidirectional approach. This includes ADLs, ambulation, sports activities, and quality of life. Functional activities and therapeutic exercises will be aimed at increasing joint stability through proprioceptive training, gentle stretching, resistance training and use of adaptive equipment to accomplish ADLs. It will be crucial to monitor vitals throughout treatment, especially blood pressure, in this population. This is particularly important in the subtypes that involve the cardiovascular system. A recent systematic review presented the evidence-based rationale for physical therapy treatment of children, adolescents, and adults diagnosed with joint hypermobility syndrome/hypermobile Ehlers Danlos syndrome. Simmonds et al. conclude that PT's "play an important role in management through exercise prescription and patient education for many of these conditions". However, more robust high quality research needs to be performed in this patient population for assessment of conservative and surgical management. There is currently not adequate research for specific EDS outcomes. However, these are some of the suggested assessment tools used to measure progress of impairments in this population. It is possible many different measurements could be used that focus on balance, gait speed, cadence, dual-task activities, quality of life, and fear of falling. Strengthening the shoulder girdle is important in patients with kyphoscoliosis. Past studies have shown that strengthening the knee in the full hypermobile range rather than just the neutral range is more beneficial to improve strength, pain, and impaired function. According to Woinarosky “the reported prevalence of JHS/hEDS in adult physical therapy outpatient musculoskeletal settings has been reported to be between 30% and 55%." Despite diagnostic differences between Hypermobility Syndrome and genetic disorders (characterized by generalized joint hypermobility), such as Ehlers-Danlos Syndrome, similar treatment approaches and interventions remain relevant and appropriate between the two diagnostic categories. Russek advocates the use of education and exercise as potential interventions for Hypermobility Syndrome. Education on ergonomics and body mechanics may result in decreases in musculoskeletal pain as well as assist in joint protection strategies. Splints, braces, and taping may also function as viable options to protect vulnerable joints. Russek suggests that therapeutic exercises, such as strengthening, proprioceptive activities, balance, and coordination to affected and surrounding joints as a means for treatment of Hypermobility Syndrome. Characterized by additional skeletal, ocular, cardiovascular, pulmonary, and integumentary signs and symptoms beyond those characteristic of EDS. Mimics hypermobility subtype of EDS, but clinical diagnosis is confirmed by the presence of a mutation in the FBN1 gene. Characterized by multiple arterial aneurysms and tortuosity. Other clinical signs and symptoms include ocular hypertelorisma and a bifid uvula. Mimics vascular subtype of EDS, but clinical diagnosis is confirmed by detection of a mutation in the TGFBR1 or TGFBR2 gene. Characterized by a gene deletion resulting in cardiovascular disease (elastin arteriopathy, peripheral pulmonary stenosis, supravalvular aortic stenosis, and hypertension), distinctive facies, connective tissue abnormalities, mental retardation, a specific cognitive profile including personality, growth abnormalities, and endocrine abnormalities (hypercalcemia, hypercalciuria, hypothyroidism, and early puberty). Clinical diagnosis consists of the presence of a contiguous gene deletion of the Williams-Beuren syndrome critical region (WBSCR) that controls the elastin gene. Characterized by a shawl scrotum, widow's peak, short upturned nose, other dysmorphic features, and occasionally mental retardation. Clinical diagnosis consists of presence of a mutation of the FGD1 gene. Not commonly confused with EDS, but does share some characteristics similar to EDS such as joint laxity and EDS-like skin abnormalities. In affected males, characterized by large head, long face, prominent forehead and chin, protruding ears, joint laxity, large testes, and moderate retardation. In affected females, characterized by mild retardation. Clinical diagnosis consists of the presence of a mutation of the FMR1 gene. Characterized by short stature with distinguished skeletal features. Clinical diagnosis consists of characteristic clinical and radiographic findings in 70-99% of affected individuals as well as the presence of a mutation in the FGFR3 gene. Characterized by the presence of multiple fractures and in some cases, dentinogenesis imperfecta (grey or brown teeth). Biochemical testing reveals the presence of abnormalities in structure and quantity of type I collagen (98% of type II OI, 90% of type I OI, 84% of type IV OI, 84% of type III OI). About 90% of individuals with Type I-IV OI present with a mutation in either the COL1A1 or COL1A2 genes. Characterized by easily recognizable dysmorphic features and/or mental retardation with severity dependent upon degree of chromosomal deletions or duplications. Simmonds JV, Keer RJ. 2008. Hypermobility and the hypermobility syndrome. Masterclass. Illustrated via case studies, part II. Man Ther 13:e1–e11. ↑ Pessler S, Sherry DD. Ehlers Danlos Syndrome. The Merck Manual of Diagnosis and Therapy. http://www.merck.com/mmpe/sec19/ch284/ch284c.html?qt=ehlers%20danlos&alt=sh (Accessed Feb 12, 2010). ↑ 2.00 2.01 2.02 2.03 2.04 2.05 2.06 2.07 2.08 2.09 2.10 2.11 2.12 2.13 2.14 2.15 2.16 2.17 2.18 2.19 Steiner RD. Ehlers-Danlos Syndrome. http://emedicine.medscape.com/article/943567-overview (Accessed Feb 15, 2010). ↑ 3.0 3.1 3.2 Castori M, Morlino S, Celletti C, Celli M, Morrone A, Colombi M, Camerota F, Grammatico P. Management of pain and fatigue in the joint hypermobility syndrome (a.k.a. Ehlers–Danlos syndrome, hypermobility type): Principles and proposal for a multidisciplinary approach. Am J Med Genet Part A, 2012;158A(8):2055–2070. ↑ 4.00 4.01 4.02 4.03 4.04 4.05 4.06 4.07 4.08 4.09 4.10 4.11 4.12 4.13 4.14 4.15 4.16 4.17 4.18 Levy HP. Ehlers-Danlos Syndrome, Hypermobility Type. Gene Reviews. http://www.ncbi.nlm.nih.gov/bookshelf/br.fcgi?book=gene&part=eds3 (Accessed Feb 16, 2010). ↑ 5.0 5.1 5.2 5.3 Wenstrup R, Paepe AD. Ehlers-Danlos Syndrome, Classic Type. Gene Reviews. http://www.ncbi.nlm.nih.gov/bookshelf/br.fcgi?book=gene&part=eds (Accessed Mar 3, 2010). ↑ 6.0 6.1 6.2 6.3 Yeowell HN, Steinman B. Ehlers-Danlos Syndrome, Kyphoscoliotic Form. Gene Reviews. http://www.ncbi.nlm.nih.gov/bookshelf/br.fcgi?book=gene&part=eds6 (Accessed Mar 3, 2010). ↑ 7.0 7.1 7.2 7.3 Pepin MG, Myers PH. Ehlers-Danlos Syndrome, Vascular Type. Gene Reviews. http://www.ncbi.nlm.nih.gov/bookshelf/br.fcgi?book=gene&part=eds4 (Accessed Mar 3, 2010). ↑ 10.0 10.1 10.2 10.3 10.4 10.5 Woinarosky N et al. The evidence-based rationale for physical therapy treatment of children, adolescents, and adults diagnosed with joint hypermobility syndrome/hypermobile Ehlers Danlos syndrome. American Journal of Medical Genetics Part C: Seminars in Medical Genetics, 2017;175(1):158-167. ↑ Liu X, Wu H, Byrne M, Krane S, Jaenisch R. Type III collagen is crucial for collagen I fibrillogenesis and for normal cardiovascular development. Proceedings of the National Academy of Sciences.1997;94(5):1852-1856. ↑ Bathen T, Hångmann AB, Hoff M, Andersen LØ, Rand-Hendriksen S. 2013. Multidisciplinary treatment of disability in Ehlers–Danlos syndrome hypermobility type/hypermobility syndrome: A pilot study using a combination of physical and cognitive-behavioral therapy on 12 women. Am J Med Genet Part A. 2013; 161A(12):3005–3011. ↑ Ferrell W, Tennant N, Sturrock R, Ashton L, Creed G, Brydson G et al. Amelioration of symptoms by enhancement of proprioception in patients with joint hypermobility syndrome. Arthritis & Rheumatism. 2004;50(10):3323-3328. ↑ Engelbert RH, Juul-Kristensen B, Pacey V, de Wandele I, Smeenk S, Woinarosky N, Sabo S, Scheper MC, Russek L, Simmonds JV. 2017. The evidence-based rationale for physical therapy treatment of children, adolescents, and adults diagnosed with joint hypermobility syndrome/hypermobile Ehlers Danlos syndrome. Am J Med Genet Part C Semin Med Genet 175C:158–167. ↑ Russek LN. Examination and Treatment of a Patient with Hypermobility Syndrome. Physical Therapy 2000;80(4):386-398. ↑ Russek LN. 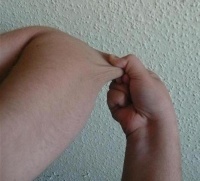 Hypermobility Syndrome. Physical Therapy 1999;79(6):591-599. ↑ Simmonds JV, Keer RJ. 2008. Hypermobility and the hypermobility syndrome. Masterclass. Illustrated via case studies, part II. Man Ther 13:e1–e11.